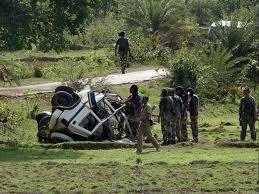 Jharkhand: CRPF personnel, 3 Naxals killed in encounter - Integration Through Media ....! JHAKHAND, INDIA: A Central Reserve Police Force (CRPF) personnel was killed while three Naxals were gunned down in an encounter which broke out earlier on Monday, officials said. “Unfortunately, during the retaliatory action a CRPF personnel lost his life,” the CRPF said.